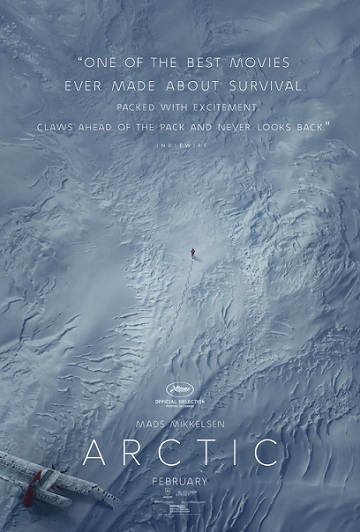 Bleecker Street releases Arctic at Angelika Film Center and Landmark at 57th West on February 1st, 2019. NYC MOVIE GURU: How important is it to know when to trust an audience's intelligence and imagination? Joe Penna: I see films sometimes that try to over-explain things and it just feels superfluous. Sometimes that's okay if you're watching a certain kind of film, but there is such a lexicon of survival films out that are great. We don't need to know Overgård's past or where he came from or how he crashed because you can imagine your own story. Frankly, that's likely a more of an interesting story for you as the viewer than what I could tell you. Mads Mikkelsen: If we had started out the film classically with him having a big fight with his dad, crashed his plane and then the whole film would be about him coming to terms with how much he loves his dad, that's not the story that we wanted to tell. It's not sadder that he had an argument with his dad; the fact that he's there at the arctic is pretty sad. Whether he's got a family, a dog or whatever is back there at home waiting for him, it's definitely something. We don't have to tell you what it is. NYC MOVIE GURU: What's more powerful: what you see onscreen or what you don't see? JP: What you do see informs what you do see. When we do give into our little idiosyncrasies and show you a little something extra, then clearly there must be more inherent meaning to that than in something that you don't see. MM: We shot the whole polar bear sequence without a polar bear and it was super scary. It was brutal as hell. At the end of the day, we said that we really don't want to see that polar bear. Sometimes you give into that, but sometimes it's better not to. NYC MOVIE GURU: Who is ultimately responsible for opening the window into the soul of a film character? MM: It's a combination. I can't run around being as interesting as I want to be if they don't shoot it the right way. Those are big words. It's what we want to do. We want that feeling--that it's not spinning, that's it's not an actor sitting there thinking, "How can I now be interesting?" We also discussed it heavily because I don't have dialogue. I don't bounce off anyone. That would keep a strong eye on having me producing something that would entertain. There's always that risk that's like, "I've done this for 2 days now. I better do something that's more interesting. ", but he wouldn't do that. NYC MOVIE GURU: How would you define charisma? Is it something that can be learned? MM: Some people agree with you that I do have charisma; some people disagree completely. It varies according to who's watching it. I can only talk about the charisma of other actors. We did a casting and looking for a young girl. There were really good actresses. Then when we watched it back-to-back later on a tiny screen, it came back to this one little girl. I didn't see that when I was acting with her. The screen just morphed her in. It was a complete miracle to watch her. Even she made mistakes, she was absolutely outstanding. The camera loved her so much and you can call it charisma or whatever. We can't define what it is. I don't know if you can learn it. It's either there or not there, but people disagree on who's got that. JP: A film with 100% charismatic actors would be just saccharine. I think you need a balance in order to create a little bit. That's all up to the casting director and the director to figure out how we're going to ham up or restrain back an actor. NYC MOVIE GURU: How important is a film's plot ultimately? Does a film really need to have a plot if often people can't remember all of the details after watching it? JP: After some of my friends watched the movie, I asked them to tell me what happened in the film because then people will tell me the plot points and everything that's important. Every single time, people started with, "This guy crashes his plane into the arctic...", but we never see that; we feel it. So you don't necessarily need incredible plotting as long as there is a shadow of that plot somewhere. MM: It becomes imaginative. All of a sudden, you can become too imaginative. For certain films, like if it's an action thriller, it would probably be a little boring watching it without a plot and just a lot of feelings. There's some police work there: you have to make it smart and intelligent. I think there's a lot of plot and a lot happening in Arctic. But I think you're right. The most important and vital thing for us to tell is that there is a difference between surviving and being alive. Can you be alive by yourself or do you need one more person to be alive? That's definitely what we were trying to say. "It's okay: you're not alone." That's the mantra of the film. NYC MOVIE GURU: Do you think it's easier to find Truth within Spectacle of Spectacle within Truth in a film? JP: If you look at a slice-of-life film, there's zero Spectacle to that and yet it could be just as engaging as a crazy, high action film that's completely Spectacle. It's just a matter of how you react to the film, the themes, and feelings that it's trying to impart on you. In Arctic, we tried to balance it out as much as possible. We talked about the bear---how we initially shot it without the polar bear actually there, but then we felt that we needed a little bit more Spectacle, so we said, "Let's go film a polar bear!" MM: I see it in a different way. When actors are presented with something, we immediately dive in finding the Truth in whatever it is. For us, it is a Spectacle, but if we can easily dive in and find the Truth then that's a miracle. But if we can't really find it, but find it interesting, we have to look a little harder and then we will find the Truth. But if it's impossible to find the Truth, we just wave our hands and say, "Good luck! I'm not in it!" We always look for the Truth. It has to be in there regardless of the size of the Spectacle. You can make a giant Spectacle and still find some Truth. NYC MOVIE GURU: Would Arctic work in 3D? JP: I would've shot it completely differently. I think this story can work in 3D, but I don't know if the way I shot it can work in 3D. Yes, I think that something is lost when somebody's watching Arctic on their iPhone because we specifically went through lengths to create these images where he's like 16 pixels on the screen, so that works if you're watching it on a 40-foot screen and not on an iPhone. MM: I learned that the hard way when I saw Arctic the first time. JP: I'm so upset that he first watched the film on an iPad! JP: Circumstance is the villain. I love films like that. MM: It's also our friend because it gives so much to this film, but at the same time it was trying to kill us. NYC MOVIE GURU: Is it also like a character in itself? MM: It's the lead role! We're just leaning in with the lead role, and we play second fiddle. There's absolutely no one out there. NYC MOVIE GURU: Do you think Overgård will eventually suffer from survivor's guilt? MM: He hasn't even gotten that far! He wants to survive first! I think that everyone has survivor's guilt in a situation where they've lost somebody. "It could have been me sitting there. I was sitting right there! Why wasn't it me??" If you have just a grain of believing in something greater than yourself, that's the question that you will always ask: "Why was I chosen? What is my purpose?" I think he would that, obviously, but he wouldn't have the extra energy to think about it in this situation. MM: Without struggle, beauty doesn't exist. It's what the old Greek philosopher Heraclitus said: without warmth, there is no cold. It does only exist because of the opposite. NYC MOVIE GURU: What film do you think would pair well with Arctic in a double feature? JP: I keep going back to the film A Man Escaped. If you're okay with watching two very ascetic films back-to-back, I think it could pair well. It's a very similar character who you're trying to figure out what he's thinking and determining what he's doing merely by his actions and not by what he's saying. There's no externalizations of any of his inner machinations. MM: Hell in the Pacific. A Japanese soldier and an American soldier are captured on an island and they keep capturing each other, but they don't know that the war is over. They're enemies, but they also need each other to stay human. Without that enemy, he's not human anymore. It's a crazy film and funny as hell as well, but there's a certain humanity in there that says a lot.